>If you’re anything like me you have a million printed out recipes on folded pieces of paper and shoved inside cook books throughout your kitchen. While my mother insists that the best recipes are the ones with the drips and stains from years of use and I tend to agree, keeping your go-to recipes in an organized (and protected) cook book is a great way to find them in a flash. 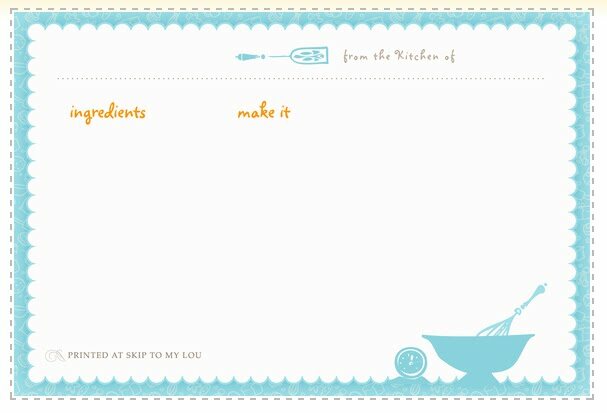 Enter Skip to my Lou and their fun do-it-yourself recipe card maker. Now you can put all your favorite recipes on uniquely designed cards and print them yourself. Use them to keep your recipes consistent or print your favorite recipe and include it in your next shower or hostess gift.